finally went horseback riding again today, it's been almost two weeks! being sick really cramps your style. i hope i'll be able to pull it together and do well in my first show... i'm so competitive :) the horse i ride was a happy camper because i remembered to bring him some baby carrots! 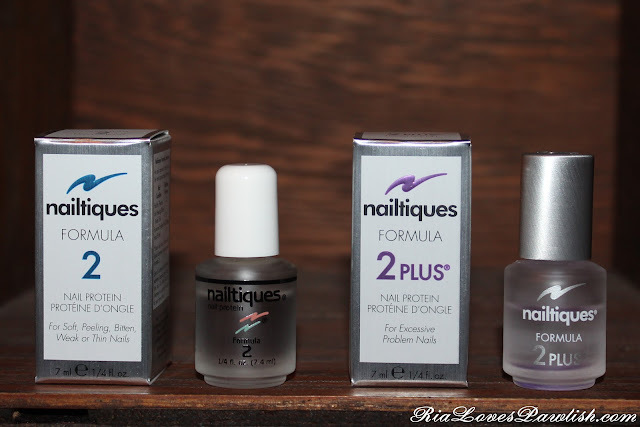 i've been trying out the Nailtiques nail proteins for a while now, and i want to go ahead and review them! Formula 2 is 'For Soft, Peeling, Bitten, Weak or Thin Nails', and Formula 2 Plus is 'For Excessive Problem Nails'. i started out using Formula 2 and did see an improvement, my nails were able to grow a little longer and didn't break as often... but i wanted more. so, i started using Formula 2 Plus... and i've really seen a change in my nails. i can grow them much longer, they peel less, and they are much harder to break. before, any slight pressure could shatter a nail, now it takes a lot more. are they perfect? no. they do still peel some, and they do chip... but they are more likely to just chip and not full on shatter! i'm quite pleased, and i plan to continue using Formula 2 Plus for the foreseeable future. if you have nails that only break occasionally, or simply peel, i think that regular Formula 2 would be plenty! they are quite easy to use, you simply paint them on like nail polish straight onto your naked nail... once it's dried, you can place whatever you like over top! the bottles come in little boxes... this is what it all looks like! these retail for around $10 and can be found at most drugstores and Ulta!